and I agree, but let me add, just go somewhere, anywhere, even if you have been there before! Traveling is one of my greatest sources of inspiration and I believe it can be yours too. We started in Vencie, Italy. The magnificence and history of this city is unparalled. A city built on a foundation of wood pilings in water that began sinking the minute it was built in 400 AD. The only highways are on the water. The taxi’s are boats. The architecture is more amazing than most anything I’ve seen, and the buildings are rich with history and stories that I will never know. But everywhere I turned, I was in awe at the ART of Venice. The most amazing opportunity came in meeting a woman that I’ve been corresponding with via IG. We met as strangers that were already friends. We are planning something in the future that I know everyone will love! Imagine Marrakech maybe. Or Cape Town? Or something else. Sometime in FEB 2019. Stay tuned…. 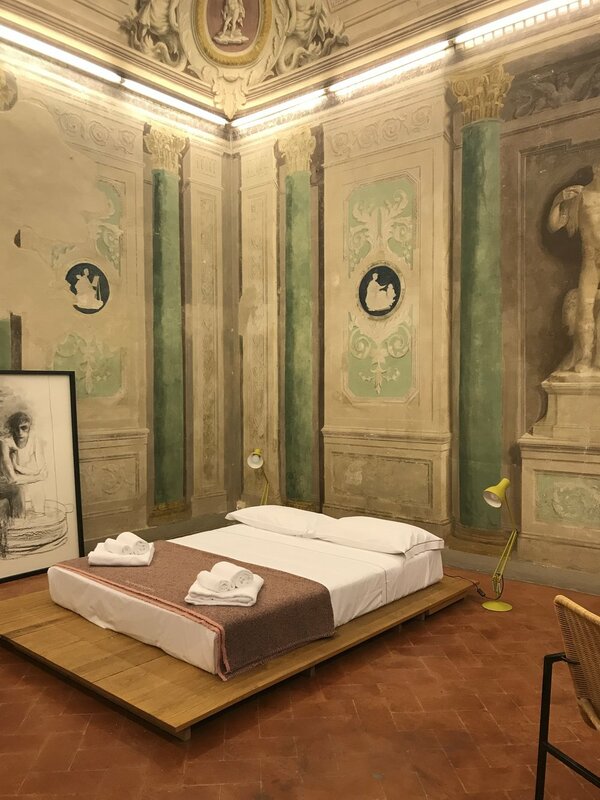 In Florence, we took in the culture, took a pasta cooking class, took a wine tour, took in the restaurant scene and stayed in a place that had original frescoes. I don’t know when the frescoes were painted, but they were beautiful and as an artist, it was fascinating and interesting to think about the story behind each one and what the artists had to do to master the difficult technique when learning the ART of Fresco. It made me feel honored to call myself an artist. Cinque Terre was the last stop before heading to Milan for a brief overnight in order to catch an early morning flight. Cinque Terre is simply magical, with beauty that defies the imagination. That’s all I know to say. The ART of Cinque Terre is that every time I looked at a hillside, the water, the boats, the sunsets, I could only utter wow. WOW. The ART of travel is yours for the asking. Traveling around your neighborhood can be a new and inspiring experience if you let it. When you travel, you learn to rely on others, you learn to ask for directions, recommendations and even what train to take. You step out of your comfort zone, and no matter how many times you’ve been to a place, there is always something new. Traveling reminds you of the ART of discovery. If you aren’t on my newsletter getting the lastest uptodate information, you may be missing out. Sign up here. Not only will I be offering some really rad online art workshops that I know you will like, say yes, but I will be hosting a random drawing in the weeks to come! But only my subscribers to the newsletter, (not just the blog) will be eligble to win.